Costa and Lloyds have both come under fire due to their recent advertising efforts. Enter the Advertising Standards Authority, the hypothetical prison guards in this scenario. So, who’s free to go… and who’s doing time (hypothetically)? Is Lloyds Bank really ‘By Your Side’? There are several iterations of this ad and the below is just an example: the iconic Lloyds black horse galloping around various scenes. It wasn’t the general public who were the most displeased with the ads, though. Various business customers, the most prolific being Noel Edmonds, complained to the ASA that the ads were misleading. The legal firm Keystone Law raised the complaint representing victims of financial fraud that was committed prior to Lloyds acquisition of HBOS stating that the ad was a misleading commentary on the victim’s fraud situation. Understandably, anyone who has been affected by fraud isn’t going to be happy about it. Are they angry at the wrong people? Maybe. The fraud being referenced occurred before Lloyds took over HBOS, two former HBOS employees were convicted of criminal actions, four others who were not employees were also charged, and all parties affected were offered compensation. 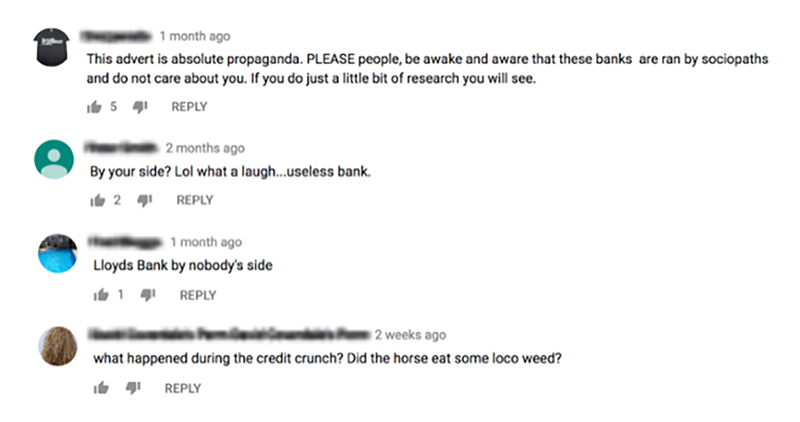 Lloyds are safe for now. A recent radio ad broadcast for Costa Coffee has been banned as it was thought to discourage the selection of a healthy breakfast choice over a bacon sandwich. Now I can completely identify with this ad. I love a good avocado and there’s nothing worse than being all set up to enjoy it only to find its past its best, and Costa have stated that their intention was to make light of the avocado situation. Unfortunately, the ASA felt that the coffee giant was comparing a bacon roll to a healthy breakfast and promoting it as a better option, which goes against the very strict BCAP code. According to these regulations, advertisers cannot discourage healthy food choices. The ASA has been cracking down on HSSF food advertisers recently, banning ads from the likes of Kinder, KFC and Kellogg’s. So Costa is one in a long line of ads banned in recent months. As advertisers, we want to run with our best ideas and we usually have the best intentions when doing so (most of the time, anyway). The ASA have always had a bit of a bad name for being sticks-in-the-mud, but they do a crucial job in the world of advertising. It’s their job to make sure that adverts are appropriate for the audiences they’re targeting and writing the standards that we, as advertisers, need to be held to. Whether it’s restricting HSSF food & drink adverts on children’s TV or protecting everyone from stereotyping and discrimination, these hypothetical prison guards have an important and difficult job to do, and, unfortunately, there are some brands who will just have to do some time. Looking for ads that won’t bring down the ASA hammer? Elastic can help! Contact us today for ads that will make a difference for your brand.